I moved to Seattle from Portland in 2002 and when I saw all that water up there I wanted to do something to experience all that water. I love backpacking so sea kayaking seemed like the obvious thing to learn. I started sea kayaking in the fall of 2002. Over the next few postings I'll jot down a few notes about my early kayaking. I learned to kayak on Lake Union and most of my early kayaking was in Seattle. Lots of workout trips on Lake Union. And for enjoyment lots of trips out of Shilshole, Alki, and on Lake Washington. We made it up to the San Juans for a few trips during this period. Our first trip was in May 2003. We camped at San Juan County Park and paddled from there. We returned again in May 2004. We saw these orcas while kayaking on the west side of San Juan Island on that trip. Welcome. 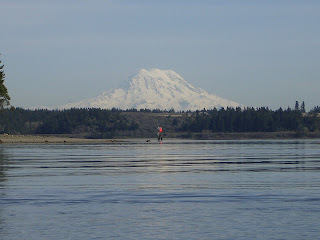 I am starting this blog to share a bit about my kayak trips. A little bit about the plan for the trip. A little about the day. A little on the hail and merry band that I was paddling with that day. A little about how I felt. And a few pictures. Mainly for friends and family that were not on the trip. But also for future trip leaders who might need information on trips I've done thus far.